You know when you are at a conference and the days seem to sort themselves into themes? Regardless of the subjects of that talks you go to and the posters you see? Well for me, Day 3 was all about change. Change that was happening, change that was recorded, change in subject silos and change that I wanted to see. The first session of the day was NH9.7 Resilience and vulnerability assessments in natural hazards and risk analysis. An interesting session, with an inclusive approach to social and physical data, the session explored many aspects of risk analysis, from social vulnerability, to assessing impacts and examining factors of sensitivity, this was the session where I wanted to see change. In the sessions that I saw the main issue I felt was that the social side of the data did not go far enough, the population was reduced to another set of data points – you are vulnerable because you live on this street, with this income and this family. In risk assessment a lot of resilience comes from the perception of risk (Slovic, 1987) and despite data, people can often be more or less susceptible to hazard because of the way that they think about it. Flooding, which has been a big part of this conference, is a particularly good example of this with people that have been exposed to a small scale flooding event changing their attitude and therefore being less likely to respond to the hazard in the same way (Grothmann and Reusswig, 2006). I find it hard to agree with risk assessments that claim to include social science, but ignore the qualitative altogether – there is a need for both forms of data in this field. But also that glacial landscape record climate change, and this I found particularly interesting as mountain glaciers provide evidence for anthropocentric climate change. 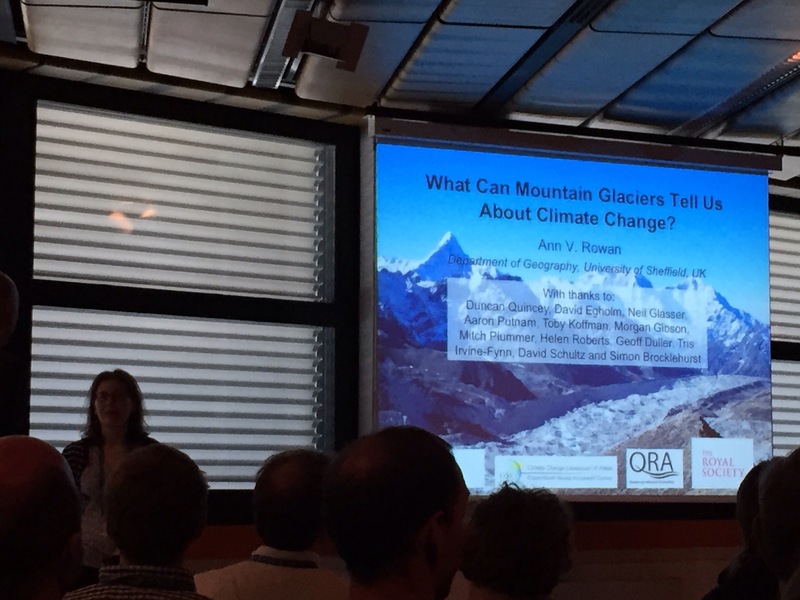 According to Ann’s research usually mountain glaciers in the northern and southern hemisphere operate on a cycle. When glaciers in the north are advancing, glaciers in the south are retreating (and visa versa), and this has been true according to the data for the last few thousand years. However, in the last 100 years, for the first time, both sets of mountain glaciers are retreating. This was really interesting to me and another example for how change is evidenced not just in the results that we get as scientists, but the way we do science! After the Penck lecture I nipped into a talk on Bárdabunga (GMPV6.1 The Bárdabunga rifting event and associated volcanic eruption) becuase, why not, and learnt that because of an extremely timely award for additonal monitoring of volcanes in Iceland in 2013 scientists were much better able to track earthquake swarms as they moved around the volcano and also deformation. Then I nipped over to G1 to see a talk by Plymouth University’s own Andy Merritt on Landslide Monitoring (NH3.4 Characterising and monitoring landslide processes using remote sensing and geophysics). The afternoon I spent in a different kind of session; EOS8 Geoethics for society: General aspects and case studies in geosciences. This was a session that examined the changes we as scientists need to make to ensure our continued reputation as responsible and trustworthy champions of our data. The session covered industrial, professional, academic and hazard communication ethics, as well as our ethical reponsiblity as storytellers and communicators. There were representatives from professional bodies, industry and academics from all over the globe – including a very interesting talk by Megumi Sugimoto on the ethical probems that contributed to the distaster that followed the Tohoku earthquake and tsunami. One talk in particular that stood out was presented by Ruth Allington and she mentioned the importance of a professional standard for both industry scientists AND academics, because, as she correctly stated, academic scientists and professional scientists are not members of a different world, they just have different responsibilities. We should all be behaving in a professionally responsible way and providing examples of this in our own behaviour. After all, we are the guardians of the public as well as of science! I ended the day in a short course on applying for grant funding (SC39 Finding funding: how to apply for a reserach grant). The course was brilliant – succinct and specific, it changed the way that I thought about applying for grant funding (something basically unachievable) and made me see it as something taht I could actually do. The main points were to be confident in your ideas, separate your work from your supervisor’s and host institution (you need to be seen as a research leader) and don’t underbudget- cheap research is not better research. All in all a very enlightening day! 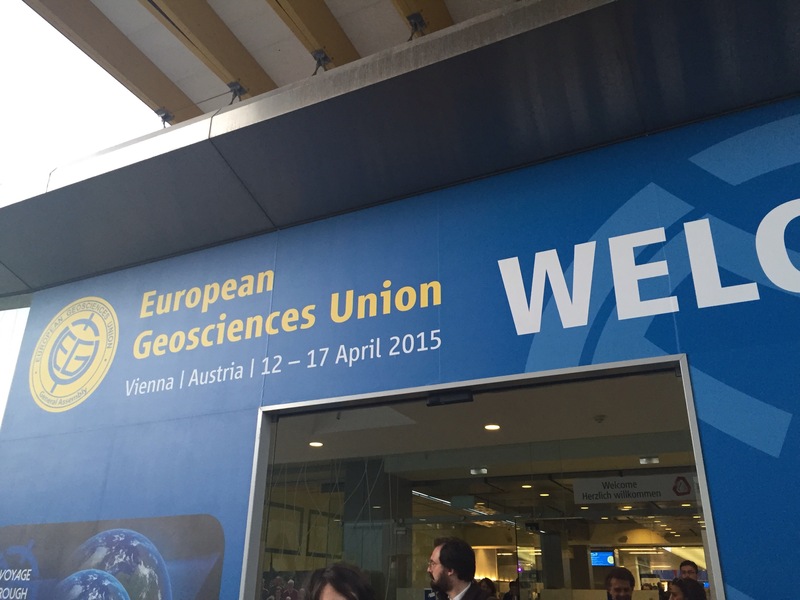 One of the things that I realised whilst at EGU last week was how broad the subject of geology actually is and how we don’t always appreciate the breadth of our subject. Some of this obviously come from the influence of interdisciplinary studies like my own, but some it comes from the unique and innovative ways that geoscientists are attempting to broaden our understanding of the planet. To highlight this I have picked out 5 things you wouldn’t expect to see at a geology conference – some more than others. 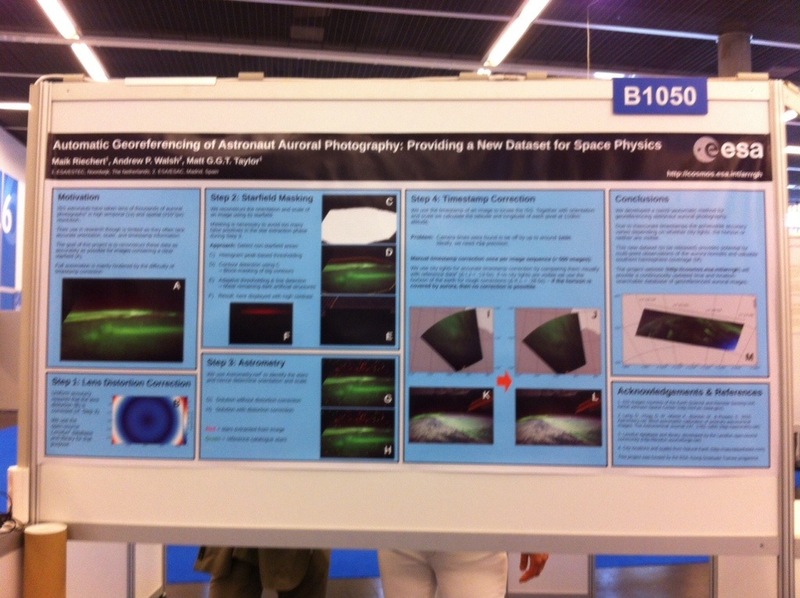 ‘Automatic Georeferencing of Astronaut Auroral Photography: Providing a New Dataset for Space Physics‘ from Multi-scale Plasma Processes in the Earth’s Environment session (ST2.2) – using data from recent space missions to advance our understanding of space physics. Recently, the work of astronaut Commander Hadfield brought the activities of the people who get strapped to a rocket and propelled beyond our atmosphere to learn more about our planet back into the public eye. But although the images they produce are beautiful, inspiring and humbling all at the same time, they are often not very useful because there is no way for scientists to tell the scale of the image or where exactly it was taken. The work of Reichart, Walsh and Taylor addresses this problem by using ‘starfield recognition software‘ to calculate the height and location of the images. Now I don’t know about you, but there is something so romantic sounding about starfield recognition software. It makes me think that the software we so often associate with catching criminals can actually be used for something uplifting and will, once fully developed, improve our understanding of how the Auroras (both Australis and Borealis) work. ‘Root Growth Studies of Willow Cuttings using Rhisoboxes‘ from How Vegetation Influences Soil Erosion and Slope Stability: Monitoring and Modelling Eco-hydrological and Geo-mechanical Factors session (SSS2.10/BG9.7/GM4.8/HS8.3.9/NH3.9) – the relationship between vegetation and how soil behaves, especially focussing on land restoration projects and management plans. When you think of geology, willow is probably not the first thing that springs to mind. However, when you think about landslides – which are most definitely geological – the presence, absence or behaviour of plants is very important. In Central Asia (amongst other places) willow is vital in facilitating the colonisation of other tree species in forests that help protect the soil from erosion. This study, although it seems like it belongs in a botany (or at least biology) conference is actually examining the material necessary to mitigate the effects of erosion, which can lead to lots of other geological problems. 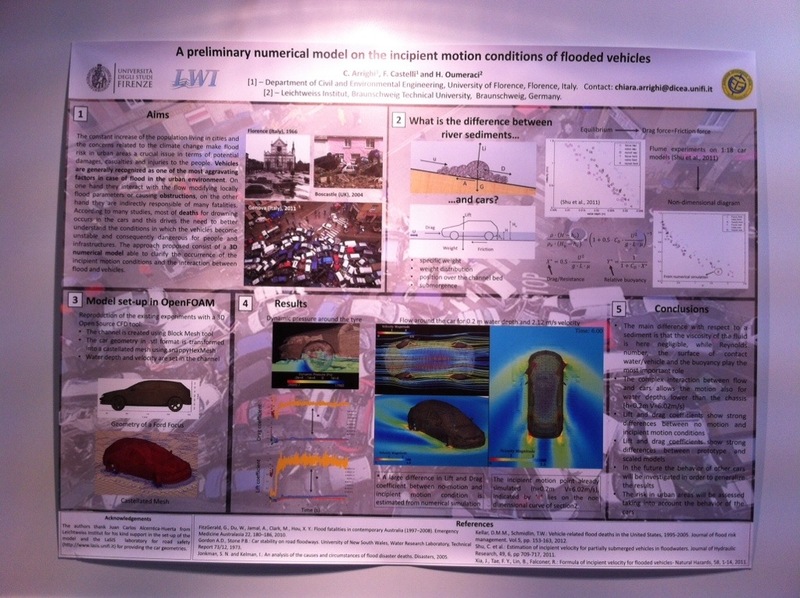 ‘A Preliminary Numerical Model on the Incipient Motion Conditions of Flooded Vehicles‘ from Flood Risk and Uncertainty session (NH1.6) – predicting current and future flood risk using state of the art flood risk assessment methodologies. This had to be one of my favourite posters – mostly due to the obvious/unexpected dichotomy of the contents. If you picture a flood, what do you see? Rushing muddy brown water tearing away at the countryside, carrying the odd tree? Perhaps. But more and more often nowadays floods are affecting our urban areas, and the thing the floodwater is likely to be dragging is a car not a tree. This work by Arrighi, Castelli and Oumeraci takes a closer look at how vehicles are affected by flood water and how they affect the flow themselves. It’s also a sobering look at how easy it is to loose control of a vehicle in a flood and explains why most studies identify the greatest cause of deaths from drowning in a flood to be a car. 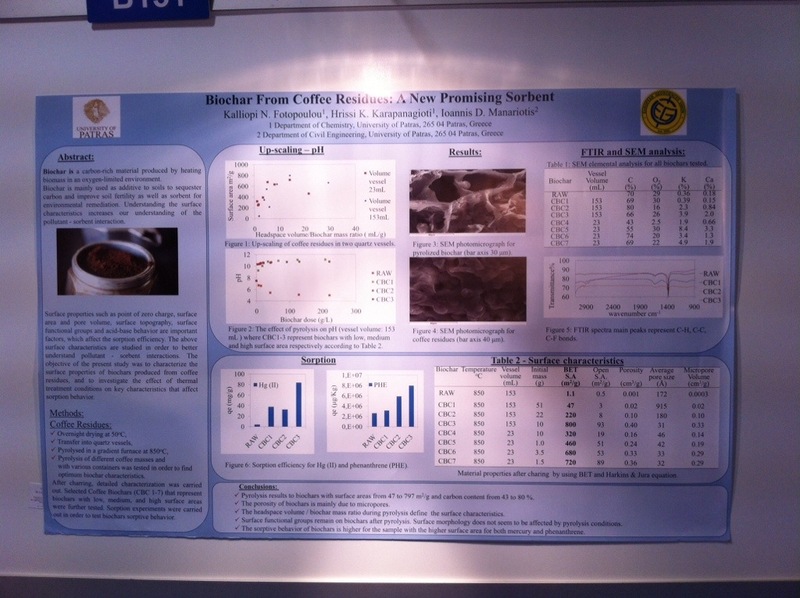 ‘Biochar from Coffee Residues: A New Promising Sorbent‘ from Novel Sorbent Materials for Environmental Remediation session (SSS9.8) – the use of sorbent materials (a material that can collect molecules of another substance) for environmental applications. If the conference last week was attended by over 12,000 delegates, how many cups of coffee were drunk do you think (added to the fact that it was nigh on impossible to get a good cup of tea)? Now imagine you could take the dregs of all that coffee and do something useful with it! Well that is precisely what Fotopoulou, Karapanagioti and Manariotis were exploring- how to use coffee residues to make biochar. Biochar is a carbon-rich substance that is added to soils in order to sequester carbon, improve the quality (fertility) of the soil and assist in environmental remediation. Who knew an old cup of coffee could be so useful?! 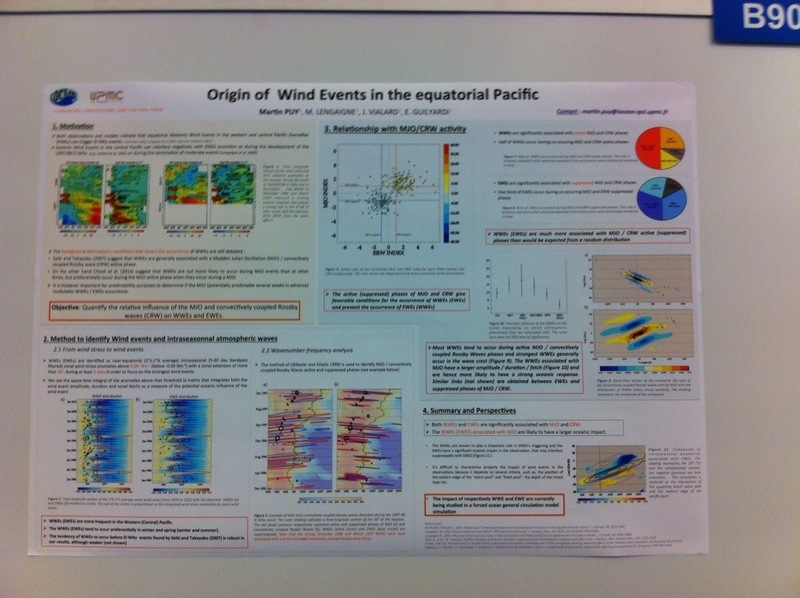 ‘Origin of Wind Events in the Equatorial Pacific‘ from ENSO: Dynamics, Predictability and Modelling session (NP2.1) – ENSO stands for the El Niño Southern Oscillation and includes all studies of El Niño and La Niña. So wind may not be that disconnected from geology – but wind patterns? Over water? 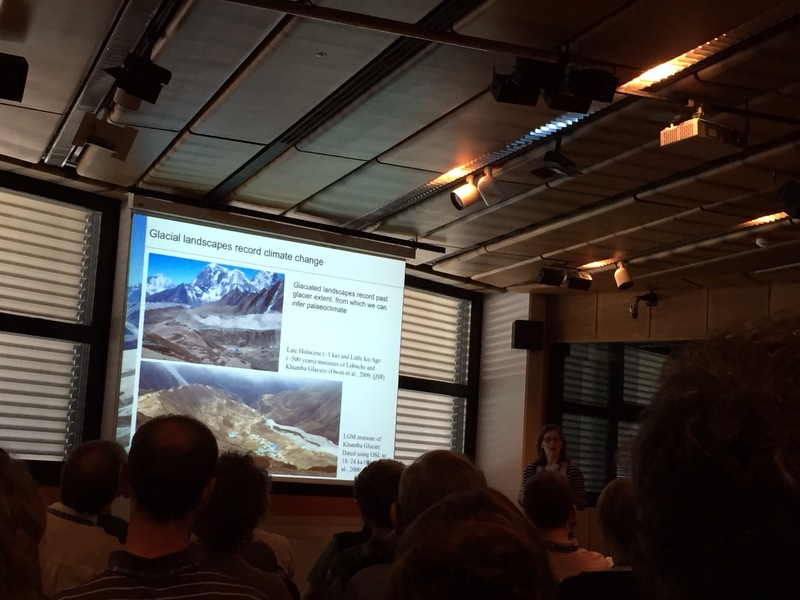 Yes at a geology conference a geoscientist’s awareness of the processes that shape our planet extends even to the climate. Which is not all that surprising really when you consider that one of the biggest issues and areas of study that geologists deal with nowadays is climate change. These are only the posters that I came across and thought interesting during the conference – I’m sure there were many many more! 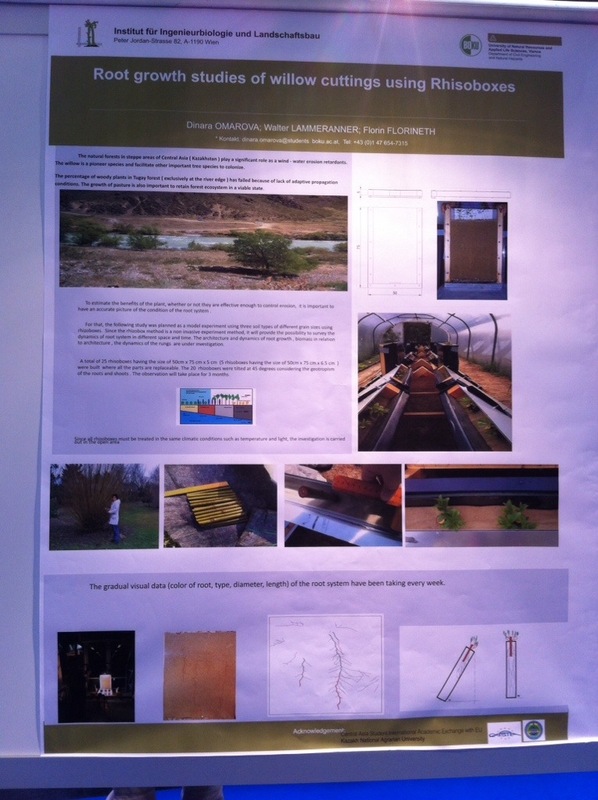 Did you see any examples of a poster or a presentation that you wouldn’t expect to see at a geology conference? !